There are several options if you want to become a nurse in the United States. 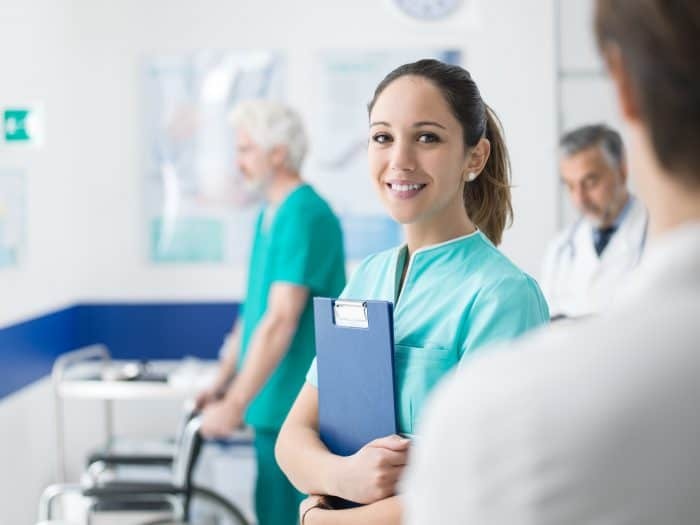 While registered nurses (RNs) need to have a minimum of an associate’s degree in order to practice nursing, you could become a licensed practical nurse (PN) and work in a medical environment without a degree. The amount of time it takes to complete your training depends on the education provider and program, but you could become a nurse in as little as 15 months. During this time, you will learn a wide range of skills that will prepare you for a healthcare setting. Usually, your program will incorporate classroom education and training in a healthcare setting. How Long Will it Take You to Become a Registered Nurse (RN)? RNs usually complete one of two educational requirements before they practice nursing. An Associate’s Degree in Nursing (AND) can take between two and four years to complete. Typically, you will carry out your training at a community college or nursing school. Once you have been awarded an AND, you can sit the NCLEX-RN — the nationwide examination for the licensing of nurses in the U.S. Remember, you cannot work as an RN without this qualification. Depending on your education provider, you might enroll in topics such as nursing, chemistry, microbiology, social science, psychology and behavioral science during your course. A Bachelor of Science in Nursing (BSN) can take around four years to complete. Depending on your education provider, you might receive training for specific health problems. Once you have graduated from your program, you will have more opportunities to advance to higher nursing positions. Some graduates, for example, choose to become nursing managers once they complete their studies. An Accelerated Bachelor of Science in Nursing programs lets you obtain a nursing degree in a quicker amount of time if you already have a degree in a non-nursing subject. These courses can take between 12 and 20 months to complete. How Long Will it Take You to Become a Practical Nurse (PN)? PNs can complete nursing training in a quicker amount of time. A PN program can take just 15 months to complete. While PNs have less responsibility than RNs, this program will provide you with the skills you need to provide routine care, maintain medication and collect data from patients and practitioners. Once you have graduated and completed your NCLEX-RN — this qualification is mandatory for all PNs in the U.S. — you can work in a healthcare environment such as doctor’s office or private residence. Advanced Placement Track programs are also available if you are already a licensed practical nurse and now want to study for an AND. These courses can take as little as 15 months to complete and incorporate classroom-based training and real-world experience in a hospital setting. The main differences between the education programs on this list are the amount of time it takes to complete your training and the topics you learn during your studies. While you learn more skills over a longer period of time with a BSN, you will still be able to practice as a nurse with an AND. Finally, a PN program will equip you with the skills you require to become a licensed practical nurse. The first step to becoming a registered or licensed practical nurse is to enroll in a training program. To start the process today, contact the American Institute of Alternative Medicine, and talk to a friendly member of staff about your options. Your brand new career starts here!